This post resulted while researching the size and opportunity for the IT security market in India. These are the businesses who have been using a desktop/PC for the last so many years and may have been using 1 or many windows-based applications for accounting, billing, point-of-sale automation, connecting to branch-office over private network, etc. There is a impending run up in the growth numbers of the SMB sector in India. In the concluded budget speech, the Finance Minister doled out sops for the fledgling sector including the government’s plan to purchase Rs. 1,60,000 crore worth goods from SMBs in 2010-11, which is 400% up from the last year’s paltry Rs. 40,000 crore. Comparing this to the developed nations the number is less than 10% of all the purchases and the balance lies in the favor of large enterprises. 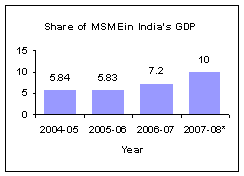 Due to the growth in this sector, the SMBs share in the India’s GDP is pegged at 10% in the closed financial year. Based on research estimates, the overall IT spend is being pegged at USD $4.5 billion of which IT security spend would be at $450 million (Rs. 1900 crore); 10% of the overall IT budget. The Indian IT security spend was around Rs. 210 crore in 2006-07 and would surge to a healthy Rs. 1900 crore as stated above. The gut feel is that the spend would be higher than 10% of the overall IT budget due to investments in fundamental infrastructure, consulting, software etc. for the first time. From a textile unit in Tirupur, to a manufacturer of automotive accessory in Jamshedpur, to a mini-steel plant in Jharkhand clocking Rs. 5 crore in annual sales; in five years from now, there’ll be easily 20 million businesses that will be using IT as part of their every day life. This all seems to come together. Sensing the opportunity – IBM, Microsoft, Sun and even desi stalwarts like TCS, Wipro have started focusing on the young but growing segment. IBM predicts that 30% of it’s revenue would be from Indian SMB segment in the next 5 years. Preventive — customer’s data leakage/theft, end-point protection of desktop/servers, backup of data on desktop/servers, anti-fraud by customers/employees, etc. It can be argued that a lot of work has been done and the market is mature with products from established companies. However, these products are not suited for small business who is just starting out with it’s IT presence. Apart from the pricing which is ill-suited, the overall total cost of ownership is very high, considering that the businesses aren’t IT savvy. More than that, a lot of them have a feature load due to maturity of their life-cycles. There are only a handful of startups in Indian segment who are working on products related to IT security, and this is a green field as I see.